Catch it BEFORE it Hits the Market! 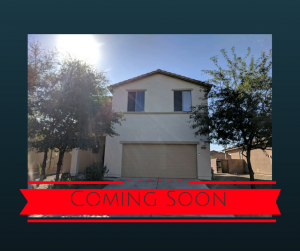 You can get a SNEAK PEEK of this 3 Bedroom Rancho Marana Beauty! A wonderful opportunity to own in the desirable Gladden Farms Community. This home features new paint inside and out, new carpet throughout, dual sinks and new faux wood tile in both full bathrooms, large loft, upstairs laundry room, all appliances included, large backyard with gazebo and MORE! Priced at only $200,000 this home will not last! Written by Nicholle Bale on November 28, 2017 . Posted in Homes Coming Soon!